SAN FRANCISCO (CBS NEWS) — West Virginia is suing the nation’s largest drug supplier –San Francisco-based pharmaceutical giant McKesson Corporation — alleging it is one of the national companies distributing painkillers irresponsibly and incentivizing opioid sales. West Virginia, which leads the nation in rate of opioid overdose deaths, is fighting the epidemic in court by suing six national companies that distribute painkillers. “In 2014 almost 19,000 people died from opioid overdose — and we’re not talking about heroin,” said Joe Rannazzisi, who was with the DEA for 29 years. He said wholesale distributors play a huge part in the epidemic. “If a pharmacy was ordering 5,000 tablets per month, over a series of months, that’s not a big deal. But one month he orders 30,000 tablets. And then the following month, he orders 60,000 tablets, and now he’s up to 100,000 tablets. Well, the wholesalers were seeing this and no one was filing suspicious orders,” Rannazzisi explained. Do they have a legal obligation to report the suspicious patterns to the DEA? During the last 10 years, the DEA has brought 12 civil suits against drug wholesalers for breaking that law. McKesson, the nation’s largest drug distributor, is at the top of that list. The DEA, along with six states, sued McKesson in 2008 for supplying hundreds of suspicious hydrocodone orders to rogue pharmacies. McKesson settled, paying more than $13 million in fines and agreeing to closely monitor their pill supply. “Even after we charged them civilly and took civil fines after them, even after they had memorandums of understanding that they knew what to do now, three years later, they started violating the law again,” Rannazzisi said. This time the wholesaler paid $150 million in fines and had distribution centers suspend operations in four states. “A civil penalty of a few million dollars or tens of million dollars means nothing when you’re making potentially billions of dollars,” Rannazzisi explained. 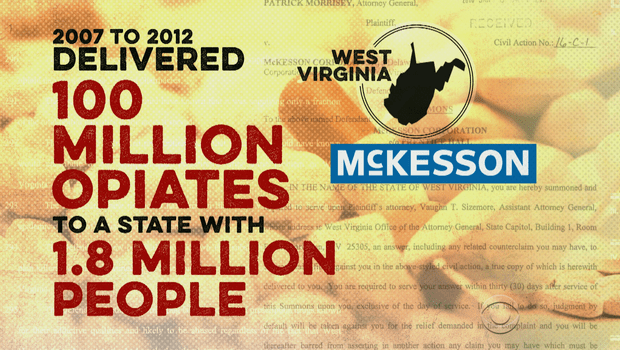 Now in a potentially precedent-setting suit, West Virginia is suing McKesson. Records reveal in a five-year period, the wholesaler delivered nearly 100 million doses of opiates to a state with 1.8 million people. Last winter we traveled to a small Appalachian town where we found Tug Valley pharmacy, which until January was supplied by McKesson. We discovered that pharmacist Randy Ballengee is facing several lawsuits for negligence — admitting to filling 150 pain pill prescriptions daily for one clinic alone. McKesson terminated its contract with Tug Valley, but only after learning about the charges from our CBS News investigation — raising the question why hadn’t the company discovered that on it’s own? “They see the tragedy that’s happening with these drugs. Why won’t you be a good corporate citizen and pull back? One day it could be one of your neighbors or, God forbid, one of your kids. Why wouldn’t you do that?” Rannazzisi wondered. While the lawsuit was filed in West Virginia’s Circuit Court of Boone County against McKesson in January, McKesson has since tried to move the case to federal court.